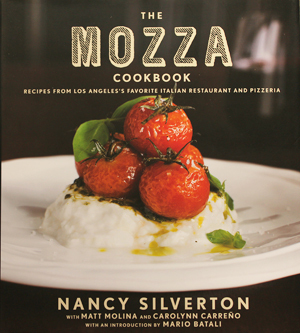 The last time I was at my book store, I was so delighted to discover Nancy Silverton’s fabulous new creation, The Mozza Cookbook, was now on the shelf. When I paged through it, I found that there were recipes for each of the dishes my friend Michele and I had eaten at Osteria Mozza a year ago for our birthdays. I wrote an entire post about our fabulous meal with fuzzy photos, because I had just gotten my camera. Grilled Beef Tagliata, Rucola and Parmigiano-Reggiano. Lamb Chops Scottadito with Insalata di Fregola Sarda, Mint and Yogurt. Burrata with Leeks Vinaigrette and Mustard Bread Crumbs. Burricotta with Braised Artichokes, Pine Nuts, Currants and Mint Pesto. I had to buy it, of course. When I got home, I was absolutely submersed for about four hours. These recipes are so reminiscent of the food I was helping prepare at Campanile when I did my internship there for culinary school. Nancy Silverton would usually wander through the prep area with her toddler son on her hip, talking to the kitchen manager on her way to the pastry kitchen on the second floor. In the early ‘90’s, she was the premier pastry chef in the nation, and I watched and listened to everything she said and did. Her desserts were known for their subtlety and perfection, and for not being too sweet. She was my idol. These Crostate are so Nancy Silverton. Subtle sweetness; a hidden surprise under the almond hat in the filling with cardamom, cinnamon and nutmeg; and the visual beauty of the sugar dusted almonds and glistening marmalade. Perfect. They are really good with your afternoon or after dinner coffee. These are a cross between a cookie and a crostata, so they are big enough that I could share half with a friend and still be happy. Just saying. The dough circles are rolled out, cut and the edges turned over to make a rim. A tablespoon of orange marmalade is spread to the rim. 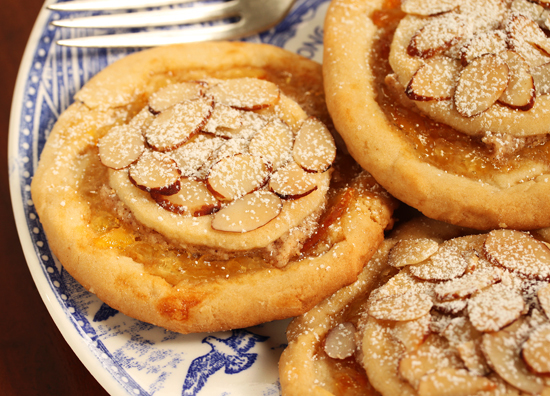 A teaspoon of the spiced almond filling is spread on the marmalade. The dough is rolled out and smaller circles are cut out to top the filling. 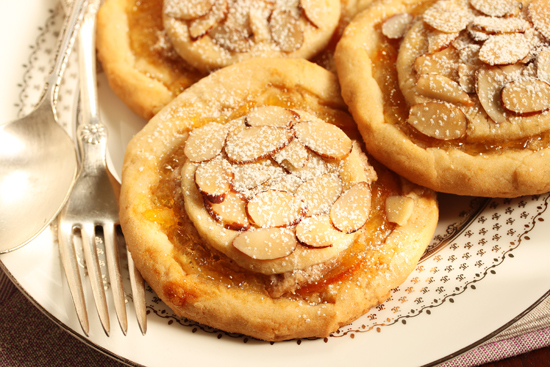 The dough hats are brushed with egg white and sprinkled with almonds. I was so pleased with how beautifully they turned out. Good enough to be served at Osteria Mozza. 1. To make the crust, combine the flour, powdered sugar, almond meal, baking powder, baking soda and salt in the bowl of a food processor fitted with a metal blade and pulse to combine the ingredients. 2. Add the butter and pulse until the crumbs are the consistency of fine wet meal. 3. In small bowl, whisk together the cream, orange flower water and egg yolk. Add it to the ingredients in the processor and pulse until the dough barely comes together. 4. Knead dough on a flour dusted surface until it comes together into a ball. Flatten into a disk, wrap tightly in plastic wrap and refrigerate at least 2 hours or up to 3 days. May be frozen for two months and defrosted overnight in the refrigerator. 5. Preheat oven to 350 degrees F. Adjust two oven racks, one in the top third and the other in the bottom third. Line two baking sheets with parchment paper. 6. Dust a flat surface with flour and cut dough into chunks. Using both hands, squeeze each dough chunk until it is softened to the texture of Play-Doh. Reform all softened chunks back into one large fat cylinder. Cut off scant 1/3 of dough, wrap in plastic and return to fridge. 7. Dust work surface and rolling pin with flour and roll large piece of dough to scant ¼ inch thick. Cut the dough with 3 ¼-inch round cookie cutter, as close together as possible. Place rounds on parchment-lined baking sheets. 8. Gather scraps, roll and cut circles until all dough is used. You should have 8 circles on each baking sheet. 9. Roll the edges of each round toward the center to create a rim about ¼ inch high on each tart. 10. Place tart shells in the refrigerator while you prepare the filling. 1. To prepare the filling, in a medium bowl, stir together the almond meal, egg whites, powdered sugar, cardamom, cinnamon and nutmeg. 2. Spoon 1 scant tablespoon of marmalade in the center of each tart shell and spread to the rim with the back of a spoon or offset spatula. 4. Place the reserved refrigerated dough on dusted surface and roll out until almost paper thin, about 1/16 inch thick. 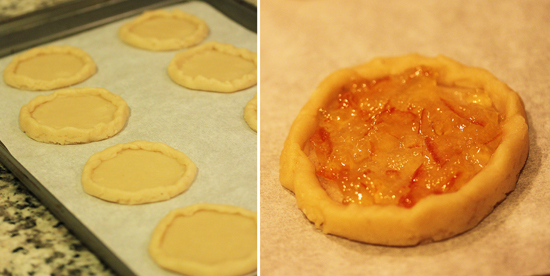 Using a 2 ¼-inch cookie cutter, cut out as many circles as you have tarts. Place one circle on top of each tart. 5. Brush each top circle lightly with reserved beaten egg white and scatter almond slices over egg wash. Press down gently to adhere them to tarts. 6. Bake crostate 20 to 25 minutes, until golden brown, rotating baking sheets both from front to back and from the upper to the lower racks halfway through baking. 7. Remove from oven and allow to cool completely before removing from parchment paper. You were very smart not to tell me about these in real time or I would’ve come by your place and stalked your kitchen. What an unusual recipe with some of my fave ingredients! These look like the perfect sweet to serve during our afternoon tea! Beautiful, easy to eat and I’m sure very, very tasty! Aren’t these just beautiful!?!? I’m loving them. I wish I could stay home from work to make a batch. Thank you for sharing another of your delicious treats. I’m drooling. I hope you are having a lovely day full of laughter and love. Many blessings from Austin, my friend. The crostate look fabulous (I always love your photos). 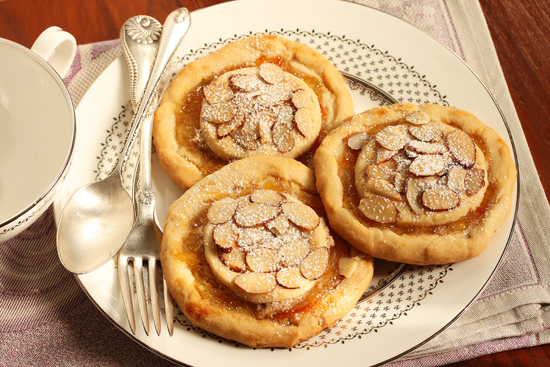 I definitely will give this a try – almonds and apricots are a great combo. Had I known you were making these, when you were making these, I too would have come over and helped myself to a few. I am also a fan of “not overly sweet” desserts. And the crostate has so much going on!!!! Tabbing for a weekend project.